We're currently hard at work on finishing up the 2013.1 versions of our products. We should have more details soon on what's new. One change we're making to our Silverlight controls is that they will be moving to the Silverlight 5 framework instead of Silverlight 4, as in previous versions. Silverlight 5 was released well over a year ago and is plenty stable at this point. A main reason for this change is so that we can support TextFormattingMode options in SyntaxEditor. In the past, if you changed your Silverlight 5 app's root visual to use TextOptions.TextFormattingMode="Display" then hit testing and some rendering in SyntaxEditor would be incorrect unless you set it back to "Ideal" on the SyntaxEditor instance. Along with the general switch for our control projects to be compiled targeting Silverlight 5, we went through all the text rendering code in SyntaxEditor and updated it to adhere to the current TextFormattingMode setting. This screen shows a SyntaxEditor with a completion list and description tip display. The left side uses the default "Ideal" mode and the right side uses the new "Display" mode option. You can see the text clarity is a bit better with the new "Display" mode. These enhancements will be in the 2013.1 version of the Silverlight controls, due in the next several weeks. In the 2012.2 version of our WPF Controls, we added two Metro themes. 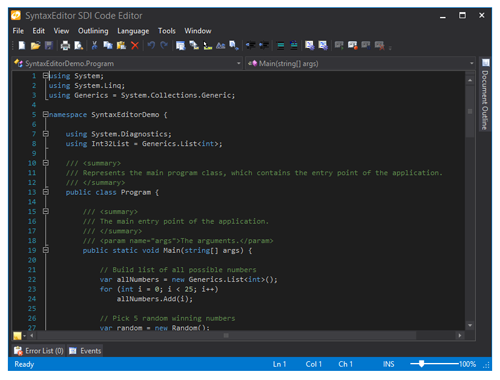 The Metro Light theme renders similar to VS 2012's gray window, and the Metro White theme renders similar to an Office 2013 window. 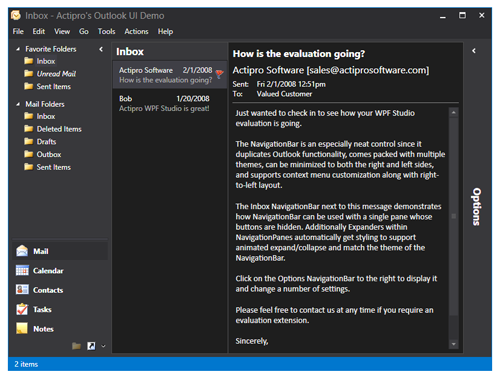 We've had several requests for a dark theme, and we've delivered one for the upcoming 2013.1 version of our WPF Controls! Here is the main SyntaxEditor demo with the Metro Dark theme active. We updated the Sample Browser to show off use of dark SyntaxEditor highlighting styles for some common languages when the Metro Dark theme is activated. In this screen, we show a mail app using the dark theme. Just like in the prior screen, it is a regular WPF Window but we've applied our WindowChrome on it to enable the full Metro appearance. All of the Actipro and native controls support the new theme. Here we see a Wizard with various text, links, and buttons all fully themed. 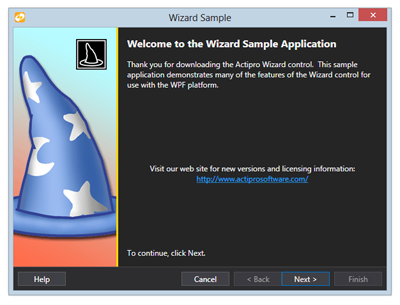 Actipro has a very robust theming system that allows you to fully theme your entire WPF application with several lines of code. We include over 10 built-in themes and they can optionally apply themed styles to native WPF controls as well. Each theme involves almost 900 distinct resource assets, such as brushes and thicknesses, specifically designed for the theme. In addition, our WindowChrome class lets you instantly transform a normal WPF Window to a chromed window that matches the theme. The end result is that your windows, native WPF controls, and Actipro controls all blend well together and provide a consistent user interface for your customers. This new Metro Dark theme will be included in the 2013.1 version, due in the next several weeks.